Ball dress. A dress of amber-coloured crape, with two flounces, scalloped at the edge, bound and headed by rouleaux of satin: the two flounces are double, each row is at some distance from the other, and between them are two rouleaux of satin, set on en serpentine. The body is en gerbe, made low, and a falling tucker of broad blond surrounds the bust. The sleeves are short and full, and are ornamented next the arm with bows of amber-coloured satin ribbon. The hair is arranged in curls and bows; the latter, much elevated, and wholly visible in front: between these are placed Provence roses, and their buds. The bracelets are of Ceylon rubies, set à l'antique, in gold, with necklace and ear-rings to correspond. Evening dress. A dress of gros des Indes, of a beautiful, bright Indian red, figured over with a delicate Chinese pattern. Two flounces ornament the border, cut in points, and are edged round with a rare and valuable trimming, formed of the small feathers of different foreign birds, which have the appearance of a fine fur. Green and yellow are the prevailing colours in this trimming. The upper flounce is headed by a row of the same delicate plumage. The body is made low, and à la Circassienne. The sleeves long, white, and transparent, of Japanese gauze, and are confined at the wrists by two bracelets; that next the hand consisting of a broad Hindostan bar of pure gold, clasped by a cameo. A row of large pearls forms the bracelet which surmounts it. 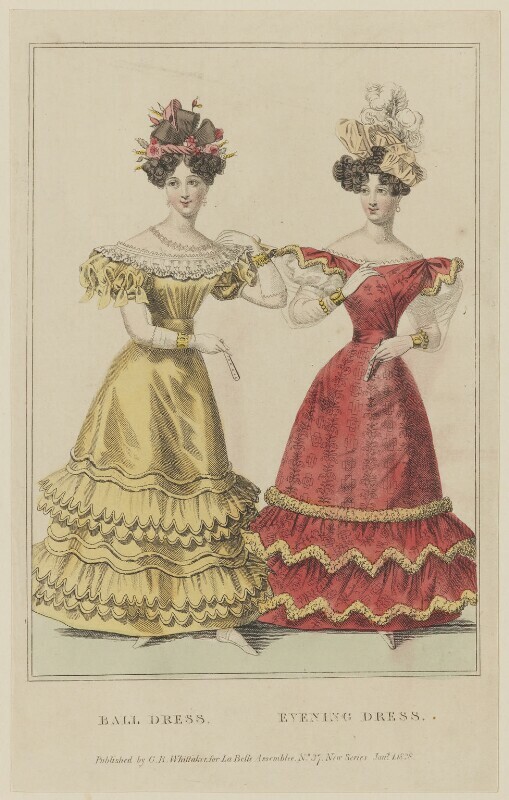 There are short, white satin sleeves under these, that are transparent; and a mancheron, formed in points, of the same material as the dress, ornaments the shoulder, trimmed round with feathers to correspond with the flounces. The hair is dressed in full curls on each side, with plaits across the forehead, ornamented with puffs of saffron-coloured gauze, and an elegant plume of white feathers.